Running does not hurt your body, it is the WAY you run that does the damage ! Being a high T, Alpha male on the wrong side of the BIG FORTY I was a firm believer in more strength, more speed and more distance to feed my unending fire for achieving running targets in quick succession….till injury put me down…I was on a one-way street to being hurt…because I was running more and more harder and pushing my limits….in a bio-mechanically unbalanced way with poor running form or technique ! Good running posture with relaxed limbs and loose joints. An efficient running technique which emphasizes the use of gravity to do your work. A focused mind which continually senses the body and the running form – mind-body connect. A graduated, enjoyable, enduring and injury-free approach to long-term running. The Posture – Run Tall. Simple logic – to run efficiently your body must be aligned to the running motion. Running tall is the key to that. Any misalignment creates discomfort and wasted effort…and most of us have poor posture because of years of sitting, lack of exercise, a weak core and possibly injury ! Slumping, breaking the back, moving side to side, over bouncing…are against the forward motion. Remove these impediments and the body moves effortlessly and speed ensues.! Tips to align your posture – Click here to quickly understand the posture. link on posture. Just to make sure that you read the link : – ) When should you practice the ‘C’ chape ? The Lean – Gravity assisted Running. The idea is to use gravity and the ground to propel you forward and not as an impediment. Adopt the tall posture and create the gentle (not exaggerated) lean from the ankles. Ensure that your feet strike the ground below the knees and you’ll notice the difference in effort and result instantly. What you have done is to use the controlled fall (ie gravity) to propel you forward rather than using the push from the legs (less effort – more results!) ! The most common mistake is leaning forward by bending your back and breaking your posture. Know the difference and be conscious of it while running! Stride Length and Cadence. Most of us overstride in our effort to run stronger – its an invitation to injury. Overstriding occurs when the foot hits the ground ahead of the hips and causes a braking motion (look at the picture of upright running above). Chi Running recommends running with the short quick strides, ie higher cadence with footstrike below the knee/hips. Cadence is the number of times your feet hit the ground per minute. 180 steps per minute is considered the ideal number. A simple method to do the same is to use a timer and count the number of times your feet hit the ground. For accurate data you can use a runners watch or heart rate monitor. The other thing is not to have a strong rear leg push-off but to pull the heel up ! The combination of high cadence, footstrike below the knee and heel raise reduces the stride length. Find your ideal cadence-stride length balance – reduce chance of injury while increasing speed. Mid-foot Running. The internet is still to decide which is better – forefoot, midfoot or heel strike while running. Chi Running recommends a mid foot strike as heel strikers naturally extend their legs forward and this creates greater impact on the body. My perspective – don’t think about it too much. As you practice the posture alignment – forward lean – footstrike below your knee, you will find a natural shift to a mid foot strike ! Trying to consciously change your natural footstrike may create imbalance in your running ! Let it happen naturally ! Relaxed Limbs. The limbs should be relaxed while you adopt your tall posture and run from your core to get a greater range of motion, pliant muscles and better blood flow. For the upper body keep your shoulders low and relaxed, arms bent at 90 degrees from the elbow and relaxed hands (as if you have caught a butterfly). Run with an easy and short arm-swing while never crossing the centerline of the body. For the lower body – loose hips and bent knees. Run lightly, don’t drive the knees up and emphasize on pulling the heel up rather than a strong push-off. Assume the tall posture. Use the image of a Column – always straight. Connect the dots: shoulders, hips, ankles. Lean from your ankles, with your whole body as one tall column. Feel yourself falling forward. Be sure your feet strike below your knees. Swing your legs to the rear. Bend your knees and let your heels float up behind you. Remember, soft foot strike, loose ankles, don’t push off with your toes. Run quietly and lightly, as if you’re trying to sneak up on someone. Loosen your hips. Keep your cadence around 180 spm. Swing your elbows to the rear, keeping them bent at a constant right angle. Don’t cross your centerline with your hands. Relax your hands, as if you’re holding a butterfly. Keep your shoulders low and relaxed. Use your arm swing to set your cadence. And that is the distilled essence of the basic Chi Running technique. I’ve practised it for three years now and still continue to refine it. It has made me faster, stronger and injury free. The best part – I finish each run fresh and strong…ready to take on anything. Do try it for four weeks or more to see good results. But knowledge alone is not enough ! Coming up soon Part II – Chi Running : From Theory to Practice. While it is easy to know the theory, the tough part is practicing it. The next will talk about tips for Chi Running before, during and after the run ! Happy Feet ! Focus your mind…train your body ! Gee Ess, a runner-thinker-blogger, constantly experiments with various running methods. He had recently written a blog on Maffetone Running , the readership of which changed the off-season running plans of many and helped many more runners with increasing their weekly mileage. As he constantly improves and learns from his experience, he blogs his knowledge to helps his tribe by keeping them better informed and become better runners. P.S. 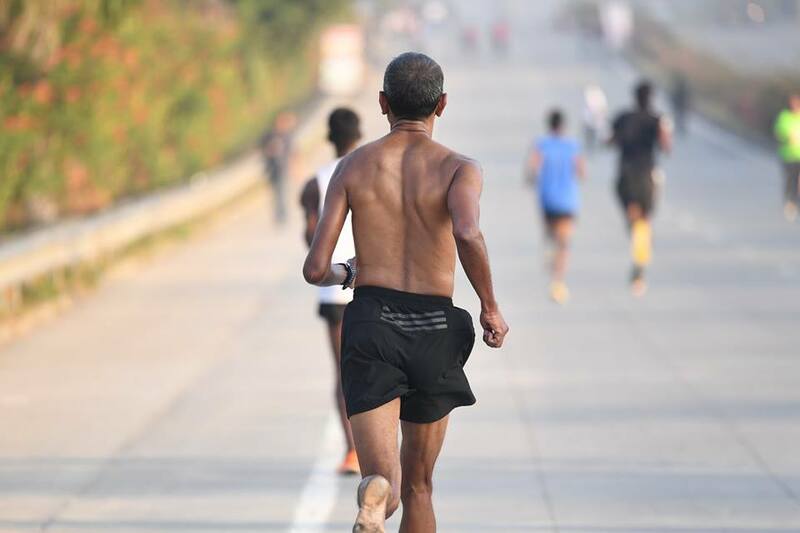 – In the featured image of this article is Thomas Bobby Phillip, from Bangalore – A Chi Running enthusiast, soon to get certified by the founder of ChiRunning as a Chi Running Instructor (one of the very few in India). Question: When should you practice C shape? Ans: Whenever one feels having abnormal posture or posture gradually slipping from normalcy, whether sitting, walking or sleeping or jogging, one should practice the C shape to bring back to normal straight posture. Question: When to practice C shape? Answer: Whenever one feels that his/her normal posture is lost or going to be lost, he/she should practice C shape so that the normal posture is resumed, be it sitting, sleeping walking or jogging, C shape give back normal straight posture. well explained however reading is easier than actual practise ..and its a voice of personal experience. True that. Do look up the next one. Trying to help convert theory into practice ! While sitting and not just while running we can use C shape to be in shape!